The Triple Profits slot machine is a Playtech powered slot that features the multispin gameplay that allows player to select reels to "hold" in a chance to spin again and land a winning combination. Read the full review below for more details. At a first glance the Triple Profits slot machine from PlayTech would appear to be a simple and straightforward version of the classic three reels slots, but this version of the game is much more complex. 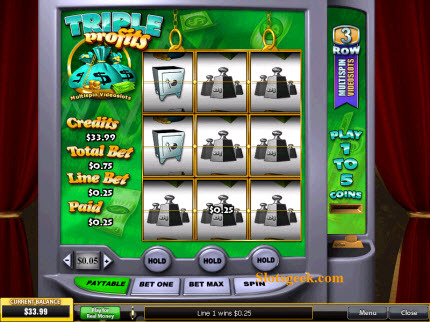 While the Triple Profits slots is a three reel and three payline version of slots, it is also a multispin game, with a wild symbol and bonus feature. These extras make the game much more challenging, rewarding and interesting. There are coin values from one cent to five dollars for the game, with a maximum fifteen coin wager on each spin cycle. The jackpot for the game is a nice and hefty one thousand coin payout, which means that both conservative and bolder players alike can enjoy some great “profits” on their efforts. The symbols for the game easily and clearly illustrate the standard symbols of wealth. There are gold bricks, dollars signs in various colors, stacks of cash, and weights and scales for measuring gold and wealth! The multispin feature allows a player a two-step spin cycle. They trigger their first “spin” by hitting the button, once the reels have stopped the player selects the “hold” buttons on the reels they would like to retain. The player then hits the “spin” button again and if any rows bring up winning combinations the player gets the appropriate award. This makes for a really interesting and interactive gaming experience, and allows the player to try to strategically select winning combinations. For the Triple Profits slot, the wild symbol is the small stack of gold bricks with the word “wild” in bold red letters across the icon. This symbol will substitute itself for any symbol but the bonus symbol in the “Triple Profits” slots game. The bonus game in the Triple Profits slot machine is triggered by three stacks of money symbols appearing in a single row. If more than a single row appears the player receives that number of bonus game opportunities. The screen allows players to select from various bags of cash (two if less than the maximum wager is made and three if a player has played the fifteen coins at five dollars wager) and once they have made their choices the amount inside each bag is revealed and the player returns to regular play. The Triple Profits slots game offers enormous winning opportunities. The flexible wager amounts can add up to some significant totals. The wild symbol of gold bricks is also the jackpot symbol for the game, and players who reveal three along a payline get the one thousand coin payout in the total they have wagered. Players who receive the red bags of money and gold symbols are rewarded with one hundred coins in the amount they bet on their spin. Green bags of cash deliver seventy five coins to the winner, and a combination of any three bags of cash brings in a nice fifteen coin reward. Finally, the weights symbols appearing along a payline give the player one coin for their gaming efforts.